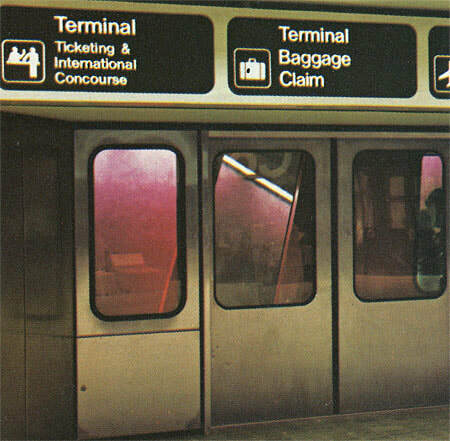 One of the most striking features of Atlanta Hartsfield Airport during the 1980s and early 1990s was a strange robot voice that herded passengers on and off the futuristic underground shuttle trains. Sounding almost identical to the Cylon robots from the 1970's TV show Battlestar Galactica, the voice became affectionately known to riders as Hal, a reference to the computer voice in 2001: A Space Odyssey. Fortunately for us, Nathan Lesueur forwarded an mp3 of Hal. Thanks Nathan! To see the "station colors" the robot refers to, look at this map. "Next stop: Concourse B. The color coded maps and signs in this vehicle match the station colors." Here is one of the maps the robot is referring to. 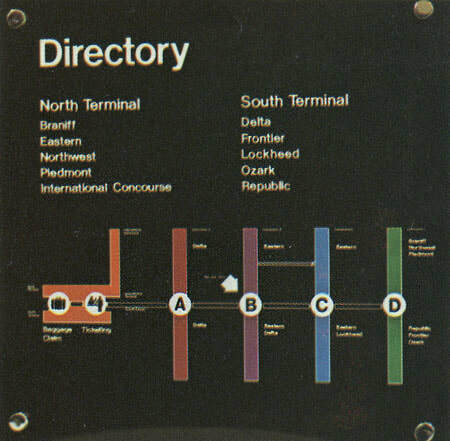 When the terminal opened in 1980, each station was brightly painted in the color shown on the map. Above you can see the orange Ticketing and International Concourse station. Below you can see the train gliding past the purple walls of the Concourse B station. Hal was not the original voice on the underground trains. That distinction goes to Kelly McCoy, known to Atlantans as a popular radio personality at WQXI "Quixie" and B98.5. Kelly was kind enough to send this story. 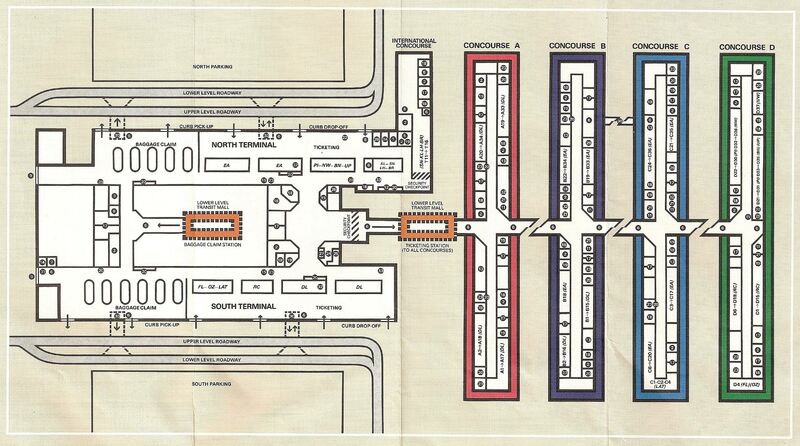 "I was the "original voice" of the "new" Atlanta Airport. Hal came in after it was decided my voice was "too friendly," and people weren't paying close attention. Hal definitely got your attention. Once we were awarded the Olympics, rumor has it that Hal may have been too frightening to the visitors from all over the world. My friend, Bill Murray (not the actor) was the kinder voice after that, if memory serves correctly." I asked him about the details of the recording session. "I was working at WQXI "Quixie" at the time. It was sometime in 1980. I got a call from a friend who was manager of a rock and roll band I'd done commercials for in the late 70s. He had a studio in Hapeville. Westinghouse, who was providing the sounds for the train, airport, etc., called and said a problem had developed with the train voice. The airport hadn't officially opened yet, and President Jimmy Carter was about to get a tour. They asked John, the studio manager, if he knew of a voice person who could do a quick turnaround. He called me. ​After I got off the air, I went to the studio and recorded all of the needed elements. It was creepy to record the emergency elements in case there were problems. Anyway, that's how I was the voice of the airport for quite a while. It was cool hearing myself on a train when my wife and I would fly somewhere. She'd embarrass me by pointing to me and saying "that's him" to fellow train travelers. All they did was look at us with a weird expression." "Move to the center of the vehicle and away from the doors." By the early 1990s, many considered Hal's robot voice to be somewhat silly and dated. In September 1994 Hal was replaced by a more traditional human voice but public outcry prompted airport officials to quickly resurrect him. 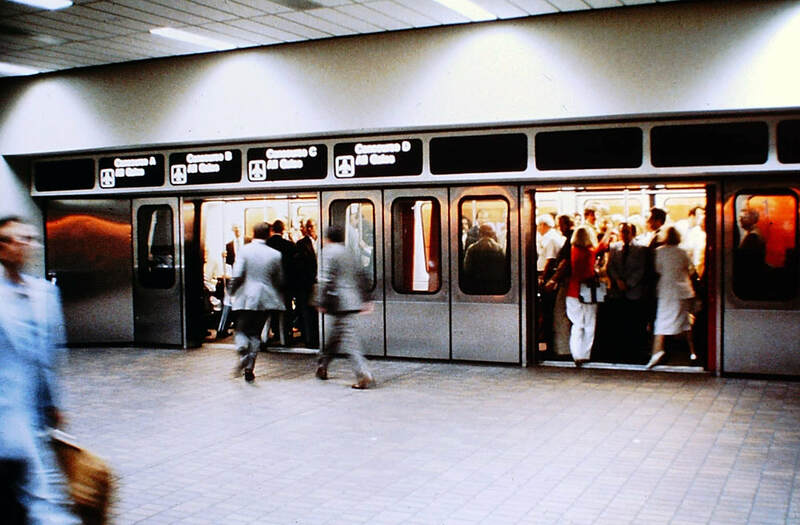 The Atlanta Journal Constitution wrote "The strange, faceless robot voice that bosses everyone onto and off the shuttle trains at Hartsfield International Airport is as much a part of this gleaming, futuristic city's identity as, well . . . MARTA." They heralded Hal's return as a "triumph of technology over humanity." On May 1, 1996 an ominous headline appeared on the front page of the Journal-Constitution: "Airport's `Hal' May Be Silenced". Testing began on one of the airport trains using a friendlier human male voice. Sadly, Hal was permanently decommissioned shortly before the 1996 Summer Olympics partly because city officials decided "foreigners can't understand it". Oh well. Hal may be long gone, but he has secured a place in history as one of the more memorable odd and colorful footnotes in Atlanta and aviation history. Many thanks to Nathan Lesueur and Kelly McCoy for their contributions to this page!